Fort Collins, Get Back Pain Relief! Americans spend at least $50 billion each year on low back pain. Back pain is the most common cause of job-related disability and a leading contributor to missed work. Back pain ranges from aching muscles to sharp, shooting pains, limited flexibility, or not being able to stand up straight. Sometimes back pain radiates from your back to other parts of your body, often your legs or arms, causing stabbing pains or numbness in those areas as well. Most short-term back pain is mechanical, caused by trauma to the lower back or disorders like arthritis. Pain from trauma can come from sports injuries, housework, gardening, or a accidents like car crashes or falls that damage the soft tissues of your spine. Back pain that lasts 3 months or more is considered chronic. Chronic back pain is often caused by a number of things compounding on top of each other and is therefore harder to treat while searching for the root cause. One common type of chronic back pain is sciatica, which refers to pain, weakness, numbness, or tingling in the leg. It is caused by injury to or pressure on the sciatic nerve. Sciatica is a symptom of another problem usually related to loss of curvature in the low back, osteoarthritis, and/or disc bulges. As we get older, the strength of our bones and the stretchiness of our muscles tend to decrease. At the same time, our spinal discs begin to lose their flexibility and fluid–two things essential to cushioning our vertebae and preventing pain. When your cushion is reduced, nerve roots can become compressed or irritated, resulting in back pain. Back pain can also be caused by a loss of the normal curvature in your low back. This curve when present is supposed to function like an arch. an arch shares the force that is being placed upon it throughout the entire structure, while a column transfers the mass that it is supporting straight down. That means whoever the low man on the totem pole is, or whoever is at the bottom of the column is taking all of the stress. In low back pain sufferers, that low man is usually your L4 and L5 disc. With hard workers and snowy winters, we see a lot of this type of back pain Fort Collins. Some back problems are due to spinal disc injuries, like herniated discs or deteriorated discs, that occur for many different reasons. If your spine becomes overly strained or compressed, a disc may rupture or bulge outward. Ruptures may put pressure on one of 50+ nerves in your spine that control your body and send signals from your brain to your body. Occasionally, low back pain may indicate a more serious medical problem. Pain accompanied by fever or loss of bowel or bladder control, pain when coughing, and progressive weakness in the legs may indicate a pinched nerve or other serious condition. Essentially, anything causing a sprain, strain, or spasm in one of the muscles or ligaments in the back. Diagnosing back pain typically requires a fairly thorough physical exam, as each patient’s body is different. 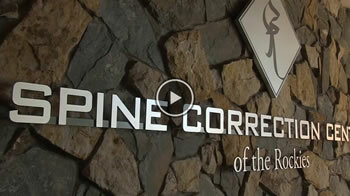 Spine Correction Center of the Rockies combines new treatment options and various providers. We offer full integrated medical care, utilizing doctors, nurses, chiropractors and therapists to get you results where others couldn’t. All of our providers collaborate to treat the whole body and all symptoms and causes of the condition. Spinal decompression is one aspect of a complete treatment strategy that also includes botanical injections, physical therapy, spinal manipulation, and active body orthotic treatment. The definition of chiropractic is, “the diagnosis and manipulative treatment of misalignments of the joints especially pertaining to the spinal column.” This is an important part of the treatments we offer our patients. At Spine Correction Center in Fort Collins we may use a technique called spinal decompression in an attempt to relieve the pain and pressure in your neck, back, low back, or legs. The procedure is designed to help alleviate the pain associated with bad spinal discs. Spinal decompression is used by many doctors and has proven, documented results for pain relief. The method is usually costs thousands of dollars less than undergoing surgery. Surgery usually entails a recovery time that in some cases can last up to six months. Spinal decompression offers little to no down time, which means more time enjoying life. Spinal decompression is effective because it creates a biofeedback loop between the patient and the computer. Disc decompression tables read the amount of stress that is being placed upon them by the patient, allowing subtle changes during treatment that allow patients to get relief. The biofeedback loop with spinal decompression overcomes back reflex actions and effectively impacts the deep soft tissues of the spine. Before the procedure can take place the doctor may order some x-rays in order to effectively evaluate the affected area. You can see some more on spinal decompression here. Because so many people suffer from back pain so frequently, there are large bodies of research studying treatments. Here are a few pieces that we feel are solid. Resolution of low back and radicular pain in a 40-year-old male United States Navy Petty Officer after collaborative medical and chiropractic care.